Publisher: Chuo Art Publishing Co.,Ltd. 12 Famous Bossa Nova numbers. 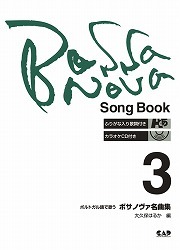 Including scores (64 pages), lyrics (16 pages), and a CD. Available at Book Service Co.,Ltd. Track1 to 12 are recorded with flute, guitar and drums as samples. Track13 to 24 are recorded with guitar and drums as accompaniments.